I’m going to attempt to use this info to form a new habit starting this week. I’m going to carry no money OR debit cards with me Monday through Thursday. That will mean no I unscheduled visits to the work cafe. No stops by the vending machine. No instant gratification of any kind. I’m finding it is taking a lot of planning this weekend but hoping to save $40-$80. MMM, I am so happy that you have mentioned habits here, because that is what it ultimately comes down to as far as life-changing personal finance (or anything, for that matter) is concerned. Some people have expressed disappointment that my blog has “evolved” from a personal finance to a “habits based” one. MY contention is that anyone can take the “correct info” and pour it into a listener’s (or reader’s) brain…we all know what we are supposed to do… Only a few of us are able to modify behavior in order to execute! It’s all behavior-based education, and I am glad to see you embracing it! Great article. Habits are what make us who we are. Breaking those habits and doing things that are uncomfortable help us grow and become better people. So I read this yesterday and went to google maps to see if I could get from my house to work without dying multiple times. Turns out there is a bike trail that runs pretty close to parallel with the road I drive. The bad news? It’s 21 miles. The good news? There’s a shower at my office. I’m going to have to work my way up to it and I make no promises for bad (especially cold) weather. But the seed is germinating. For good measure I went home last night and busted out the bike to ride 4 miles round trip to the store for beer. I’ve been reading a myriad of personal finance blogs over the past week, came across yours today. Great article, I know about habits all to well. I like the idea of walking or biking more. Unfortunately when your destination is 10-15km away it’s a little harder to do so. Last summer I experimented parking 1-2km away from my destination and walking the rest. I’ll have to start picking this back up again now that spring is here. :) Every little bit will add up. Another change for me to make is going to a cash only method of payment. Start leaving the ole credit card at home. Can’t believe I hadn’t read this excellent post before – thanks for featuring it. I will have to dedicate some time to pondering some of my habits and seeing where they can be modified. On another note, minor nitpick from a Cincinnatian (where P&G is headquartered) – it’s Procter and Gamble, not Proctor. It feels wrong because proctor is a word and procter isn’t, but Procter is a surname in this case. I just came across this old post and realized that the illustrated Mustachian in Fig. 2 does not actually have a mustache!! Oversight, or subliminal message that everyone can be Mustachian? What is this? The mustachian loop dude doesn’t have a ‘stache? do my eye deceive me? I discovered this blog about a month ago, and have been reading every entry from the beginning, chronologically. Well, it was as though I hadn’t even responded. One person immediately said she could “never starve herself”, and then everyone just went back to lamenting how much they struggled with losing weight. Reading this post by MMM made me realize that their responses were all about habit formation — not just habits of eating, but habits of expecting failure. It was quite an a-ha moment, which can be applied to many areas — financial independence among them. To your credit and in defense of your friends, fasting is a pretty badass and advanced habit to just jump into. Are bikes banned from the bridge and there is no sidewalk? If so I’d probably still do the ferry and avoid driving – the cost might be roughly breakeven, but the physical and mental benefits of getting to work by muscle power are worth much more than a few bucks. Since starting this blog I’ve started riding my bike for groceries and am in the process of downsizing my expensive hybrid for a less expensive high mpg car (old Prius). There’s been a bit of a hump to get over with biking, mostly irrational fears, but I feel way healthier, clearer, and happier to be more sustainable. This is very true. I spent 6 years car-free, using my bike to commute to work and study places, and do other utilitarian jobs such as grocery hopping and going to the hardware store. By doing this, I saved a significant amount of money and increased my health and feeling of self sufficiency. However, during 2014 I packed away my bike and all my gear in storage, and set off on an adventure driving a 4×4 campervan around Australia. 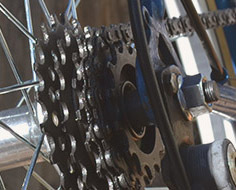 It was a great time, but being ‘off the bike’ for almost a whole year defintely messed up with my bike riding habits. It took me another two months after getting my bike, tools and bike gear/clothing back before I started to shift habits away from driving my massive, heavy, expensive-to-run van around and us my bike again for short and medium trips (2-10km). I remember the first trip I took to the next town for an appointment I had. In my mind I was thinking up all these excuses: “it’s too far”, “I’m not fit enough”, “there’s too many hills around here”, “it might rain” blah blah blah. All these weak, complainypants excuses that I used to laugh at other people about when I heard them myself in the past. And now I was the one doing it and seriously considering just driving instead! Thankfully I had the willpower to give myself a facepunch and recognise how ridiculous I was being, and, with a bit of deliberation, I suited up, checked the route on my phone, jumped on my bike and went off. And you know what? It was one of the most enjoyable rides I’ve had in years and took half the time than I anticipated! I ended up riding for a few hours that morning, enjoying the green hilly scenery and mild weather that is so common in my new hometown. My next step is to sell the campervan, as it’s a serious drain on my now-limited finances, due to the combined load of ownership, maintenance and running costs. By the end of this year I should hopefully be back in a position where I am car-free again and not at a disadvantage for it. It’s all about making informed, strategic choices where you live, work and study. Hint: Living in an area where you are 40km from the main employment centre, and not having work from home to do as an alternative, is not the right path to being car-free or less reliant on needing a car. I have a question based on your last paragraph. I went to a conference in 2003 at Stanford University. On our free day, we explored the area. Ran into a guy who had a great job in Palo Alto, but couldn’t afford to LIVE there. So he had some ridiculous commute by train. So what do you do to be Mustachian when the jobs don’t pay enough to live in THAT area, but only enough to live 30+ miles away? Now granted, California is probably one of the most extreme cases(along with Manhattan), but I know that may also be the situation in many other areas as well. I am a newcomer to your *AMAZING* blog, and after a year or so of searching around and implementing financial advice from others (such as Dave Ramsey), yours fits with my own values and therefore has stuck. I live in Michigan and we currently have ice-slicked roads and snow about 9 inches high, which makes biking with 2 kids in tow a bit of a challenge, but as soon thawed-sidewalks hit, I’d like to start riding wherever I can. I’m a social worker, and have to have a car (my particular company doesn’t provide them like some do) to transport myself to home visits that can be anywhere from 6-100 miles from my house. However, the rest of my life is within about 6 miles from home. Preschool- 2 miles, Stores- 3 miles, Office for days that are devoted to reports and no travel- 5.5 miles. I was wondering if you have any tips for biking with a kid (or two) in tow. The only thing that makes me nervous is that our town isn’t exactly bike-friendly like some others I’ve seen. People haven’t jumped on the wagon, yet, so safety regarding biking around town is a concern. The only other one is my 3.5 and 2 year old fighting in their little cocoon behind me. ha. New reader here! I love the advice, and wisdom you offer on your blog! Reading your blog posts has given me a greater understanding of basic financial principles, and money-spending/saving habits. I want to thank you enough for that! 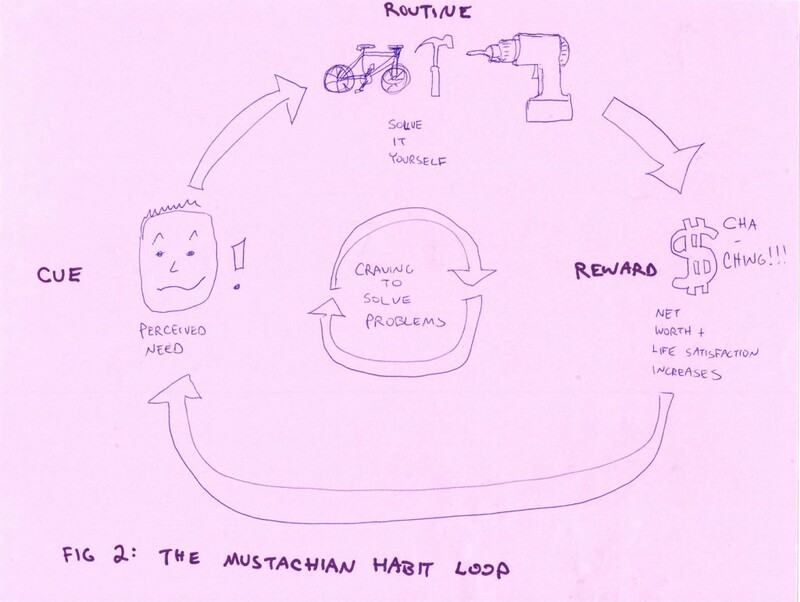 Also, I drew my own version of the Mustachian Habit Loop :) On behalf of all visual learners – keep the drawings coming! This is an old post, but I hope someone is here who might help me establish a keystone habit to keep my place clear of clutter. I’m a huge reader, both print and online and all that reading takes so much time that I tend not to deal with all the papers I collect, some of which should be filed, some read, some thrown away. My financial habits are pretty good, but wish I could figure out a way to beat this. Try get rid of it app. It’s a way of decluttering daily. It’s been a fabulous habit in my life over the last 4 years. I try to de-own 20-30 items daily. Even if it’s just paper. It really does add up. Life is way better with less clutter. A published author and creative writing professor I know thinks of books as living. They want to be read. Not enshrined. See if you can pass along 1 book daily to someone who will read it. Share that experience. 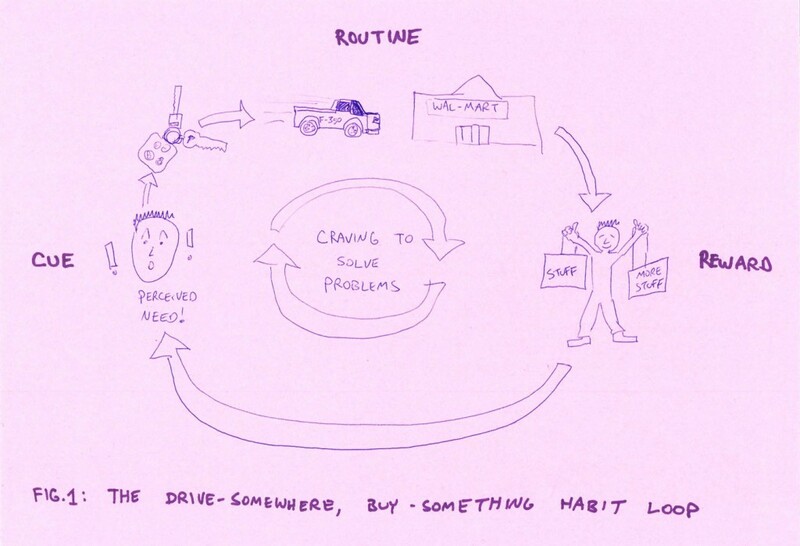 I’ve been experimenting with Keystone habits too… making my bed everyday is the first one. I also find that those questions we ask ourselves (like yours, “will this increase happiness?”) are so helpful… As a non-car owner, I either take public transit or use a bike-sharing service to get to work in the morning. The question I ask myself after I drop off my kids or after I leave the office is, “Do I want to go underground right now?” On gorgeous days, the answer is a resounding no, so on the bike I go! I’ve read this article 2 or 3 times in the last year or so. It’s great. This time I thought more about training my children. I read the power of habit book and tried to get my oldest to read it. I struggled with some stupid bad habits early. My first credit card was a Canadian Tire card at 28% interest and only made minimum payments. I used it for cash advances which is even more stupid. My oldest is getting into a consumerist habit with shoes and is now focused on Chocos at $100+. She does well with not spending more than she has, because we won’t lend, but does spend all that she has. I want her to establish good habits early because fixing bad habits is difficult, even with Duhug’s system you describe in the article. So, reading this again has helped fire me up to return myself to teaching her to set good habits. I am a huge believer of this philosophy and I’m constantly trying to learn new things or start new projects just to keep my life interesting. I took a break and went back to school where I made new memories and broke up the monotony of a corporate job. I’m really looking forward to what life brings my way after I finish my degree!